now offers an alternative for changing Oluce's Cornalux/Hammerhead bulb: the new version has a Pyrex glass cover with a B22 adapter on entry and a G9 adapter on exit. 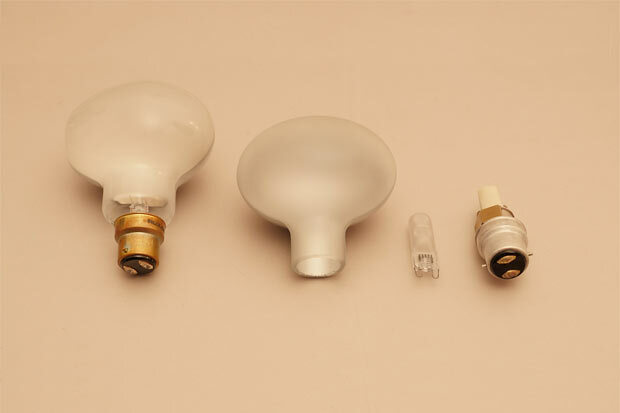 New Oluce Lamps include this new style of Cornalux Light Bulb Housing. If you have an older Oluce Floor Lamp and are looking for replacement light bulbs; the new Perspex Glass Oluce Cornalux Light Bulb Housing is available by special order from Stardust for $160.00 excluding the G9 required light bulb (purchase any type of halogen or LED bulb 48W max). 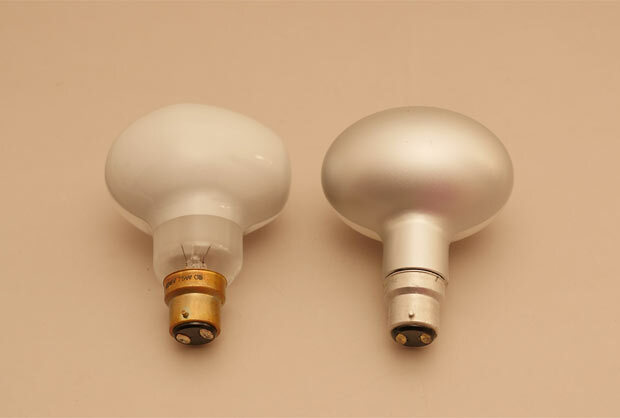 On the left is the "old" incandescent cornalux light bulb. On the right is the new Cornalux Light Bulb Replacement Housing which is an improved version. Simply slide a G9-type LED or Halogen light bulb into the socket for years of worry-free service. The Cornalux Light Bulb Replacement fits in the Olcue Spider Floor Lamps and the Agnoli Floor Lamp among others. The Cornalux (B22-75 watt) with its famous “hammerhead” is symbolic of some of the most famous lamps made by Oluce, such as the Agnoli 387 designed by Tito Agnoli in 1954 and then in 1965, the Spider series by Joe Colombo. Left: old Cornalux Light Bulb. Right: new Cornalux Light Bulb. This will enable all owners already in possession of lamps from the Spider and Agnoli series to replace burnt out Cornalux bulbs with the new accessory, adapting it to the new sources without modifying its distinctive “hammerhead” shape, crucial in order to ensure the design of the lamps remains unchanged, also guaranteeing a longer life and significant energy savings. without modifying its distinctive “hammerhead” shape, crucial in order to ensure the design of the lamps remains unchanged, also guaranteeing a longer life and significant energy savings. The eco-halogen source with G9 adapter actually has an average life of approximately 2,000 hours of use, compared to the current average of 800 hours for the Cornalux. Last but not least, the new accessory has been designed to also mount bulbs with a LED source and G9 adapter with an average life of approximately 25,000 hours.